Experts are urging policymakers to conserve mangrove forests and recognise their essential services to nature and humanity alike, saying that shrimp farms and development activities leading to their replacement will be a bad economic trade-off both in the short and longer terms. Organisations from the forestry and conservation sector and those linked to the United Nations (UN) have released a policy-brief based on the 2nd edition of the World Atlas of Mangroves (2010). It aims to provide managers with lessons learned in the past mangrove conservation and management efforts along with policy recommendations. Found mostly in the tropics straddling land and sea, mangroves account for less than half the one per cent forests of all kinds worldwide. Taken together, some 70 species of mangroves are found in 123 tropical and sub-tropical nations and territories but they occupy just 152,000 square km in total-an area slightly larger than Nepal. Yet these so-called ‘forests of the tide’ provide enormous benefits to humanity, especially as essential harbours for biodiversity, as buffers against the destructive power of waves, and as nurseries for coastal and offshore fisheries worldwide. Conversion of mangroves for coastal aquaculture is the foremost driver of mangrove loss, the report says. An estimated 38 per cent of global mangrove loss can be attributed to the clearing of mangroves for shrimp culture, while another 14 per cent can be blamed on other forms of aquaculture. “Such large-scale conversion has had major negative environmental impacts. In a region where fishing in and around mangroves is a critical activity providing food and income for millions of people, the socio-economic impacts of this conversion have been tremendous,” adds Ms. Van Lavieren, Coastal Zones Programme Officer at UNU’s Canadian-based Institute for Water, Environment and Health (UNU-INWEH). Losses are being driven by other human threats as well, however, including over-harvesting and deforestation, agricultural, urban and industrial runoff, oil spills and poorly-managed dredging and coastal development. “These practices continue to take their toll and if left unchecked will cause significant economic and ecological decline,” says Dr. Mark Spalding, Senior Marine Scientist at The Nature Conservancy and co-author of the report. Climate change will exacerbate existing pressures, the authors add. About 5 to 20 per cent of coastal wetlands (including mangroves) will be lost owing to sea-level rise by 2080. The most pronounced losses (over 20 per cent) have occurred in the Asian and Pacific regions, followed by Central America. Limited losses have occurred in East Africa, with only an 8 per cent decline between 1980 and 2005. In some countries, the extent of loss has been much higher than the regional norm. For example, the UN Food and Agriculture Organisation estimates that Pakistan, Honduras, the Democratic Republic of Congo, Vietnam, Sierra Leone and El Salvador each lost more than 40 per cent of their 1980 coverage by 2005. In Australia, Bangladesh, Cuba, Suriname and French Guiana, the extent of loss has been kept to less than 1 per cent over the same period. “The variation between the countries can be mostly attributed to national policies and legal protection,” says co-author Zafar Adeel, director of UNU-INWEH. Mangrove forests serve as highly effective carbon stores and sinks. Alongside living biomass, mangrove soils are carbon-rich, sequestering carbon over millennial timescales. Near-shore fisheries amid mangroves are well documented and of much importance to many communities, but many large-scale fisheries, such as commercial offshore shrimp fisheries, are also highly dependent on mangroves as nursery or breeding ground. Mangroves provide rot-resistant, high-value timber and excellent fuel wood, which has been harvested under sustainable silviculture programmes in some countries for over 120 years. In many settings, mangroves act as a form of natural coastal defence, reducing erosion, attenuating waves and even reducing the height of storm surges. In the longer term, they can also help build or maintain elevation in the face of rising seas. The report says economic valuations of mangrove ecosystem goods and services provide some of the most powerful arguments for effective mangrove management. “A growing number of economic valuations are being conducted and most of them reveal considerable benefits, even from single services such as fisheries,” says Dr. van Lavieren. “When the full suite of ecosystem services from mangroves can be assessed, the arguments for maintaining healthy mangrove forests are usually compelling.” Specific examples of the economic value of healthy mangroves include prawns harvested in Australia across the wide shallow coastal shelf areas off both the Northern Territories and Queensland — one of the country’s most valuable export fisheries, earning almost US $72 million annually. One study cited in the policy brief shows that planting and protecting nearly 12,000 hectares of mangroves in Vietnam cost just over US$ 1 million but it saved annual expenditures on dyke maintenance of well over US$ 7 million. Meanwhile, the Matang Mangrove Forest Reserve in Malaysia is cited as arguably the world’s best example of a sustainably managed mangrove ecosystem. Established in 1902, it covers an area of about 500 square km, approximately 73 per cent of which is considered productive forests, while the rest is classified as non-productive or protected. Only non-destructive forestry, fishing and aquaculture practices are permitted. Re-vegetation programmes are implemented two years after the final felling as required. Annual value of the forest products between 2000 and 2009 was estimated at roughly US$ 12.3 million, with cockle aquaculture adding an estimated annual value of US$ 10.7 million. “It is clear that integrated and stringent management actions are needed to protect remaining mangroves.” The report describes the instruments and measures readily available to help conserve and manage mangrove ecosystems and highlights lessons from around the world on successful measures for protecting mangroves. And it offers recommendations to improve legal and policy frameworks, mangrove management tools, data and information collection, economic incentives to promote more environmentally-responsible behaviour and local livelihoods, recognition of the full value of mangrove ecosystem goods and services, including carbon stores and sinks, and coordinated global action under agreements related to biodiversity, wetlands, sustainable development and climate change. Enhancement of existing carbon stocks and reversal of CO2 emissions by increasing protection and restoration of mangrove ecosystems, and integration of mangroves with emission trading and climate change mitigation planning. The World Atlas of Mangroves documents over 3,840 square km of restoration projects worldwide and “there are doubtless many more,” notes Dr. Spalding, who was the lead author of the Atlas. However, “reversing the trends of mangrove loss and of growing vulnerability of coastal peoples will require a real commitment by governments to develop and implement robust high-level policies,” the report concludes. These are underpinned by many successful examples of mangrove management from around the world, and by solid and convincing economic arguments. Trends of mangrove loss can be rapidly slowed with good management practices, laws and establishment of clear frameworks for mangrove ownership, use and management. Restoration has also been widely in place in many countries and it offers the possibility of reversing the patterns of loss and brings considerable benefits back to many coastal areas. This clear understanding of the management interventions is required to secure the mangroves’ future. 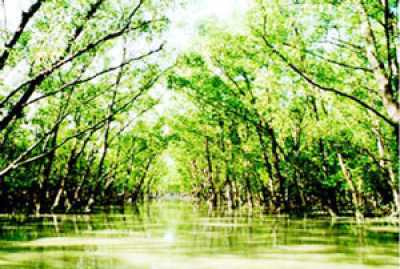 The policy can be applied to the world’s largest mangrove forest, the Sundarbans, in Bangladesh.